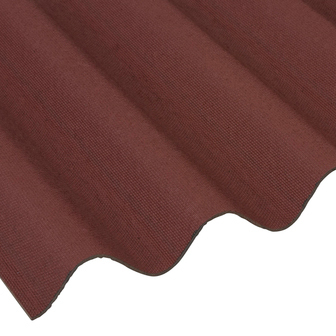 Onduline heavy duty bitumen sheets are extremely tough and hard wearing providing a highly durable roofing material for larger timber structures. Manufactured from bitumen soaked organic fibres, the sheets are guaranteed weatherproof for 15 years. Onduline sheets are available in a choice of Black, Green, Red and Brown. Installation guidance available on request. ie: the roof is 3000mm wide, divide by 855mm = 3.5 sheets. Round this figure up to the nearest full sheet - 4 sheets will be required. Divide the roof width by the fixing centres. Divide the roof length by the support centres and add 3. Multiply these two values together. = approximate number of fixings required. This product is covered by a 15 year waterproof guarantee. A replacement is provided free of charge if the product has failed to remain waterproof, in normal weather conditions within a 15 year period from the date of purchase. Coroline MUST be fixed and maintained in accordance with the manufacturer's instructions for the warranty to remain valid. Re-erections or consequential damage costs are not included.